The International Court of Justice issued a ruling today that redraws the maritime border between Chile and Peru, handing Peru more than 20,000 square kilometers of the Pacific Ocean that belonged to Chile. The court denied Peru's claim to a much larger piece of the ocean, but the decision is being widely viewed in Chile as a victory for Peru. Indeed, Chilean politicians seems to be on the defensive, and there have been protests in Santiago and Arica. On social media, some Chileans are lambasting Peruvians, with typical nationalist fervor. Chile's government lamented the ruling, but reiterated that it will abide by the decision. It added that even with the loss of territory, Chilean fishermen keep most of the important fisheries. That hasn't appeased fishermen in Arica, however. On the military front, the only significant military movement was in the Chilean Navy, which set out to sea just days before the ruling, ostensibly for routine exercises. Chilean travel to Tacna, the Peruvian border city, slowed sharply last weekend. But no one expects any shots to be fired. There are some scenarios I've pondered that could inflame the crisis. For example, what it a Chilean fishing boat defies the ruling and is apprehended by Peruvian forces? Would Chile defend the fishermen? 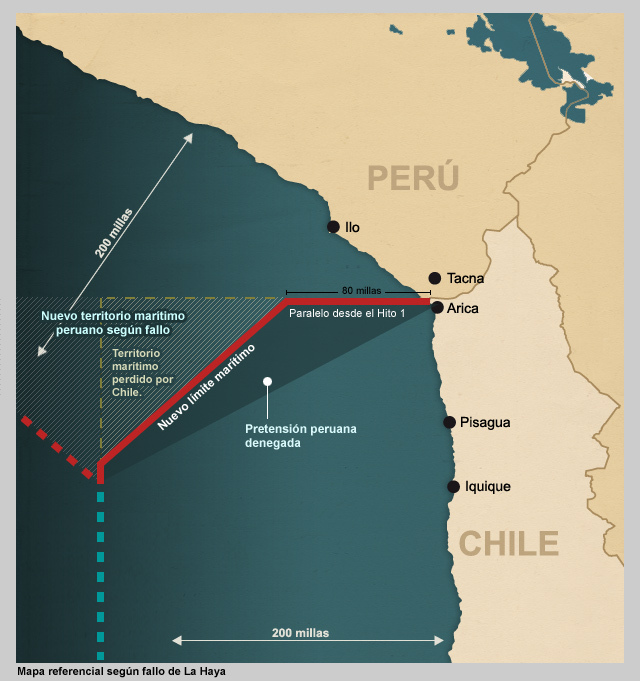 Likewise, would Chile immediately allow Peruvian fishing boats into the area? Would a treaty be required to formalize the court decision? If so, would Chile's Congress ever approve it? One conclusion is clear: For President Sebastián Piñera, it was a political defeat that capped a problematic four-year administration. Update: Peru wasted no time asserting its sovereignty over the new territory, sending its navy into the area. As the presidential term of Sebastian Piñera winds down, so are hopes to eradicate the copper tax that has provided Chile's military with billions of dollars. Piñera now becomes the second-straight president to fail to win passage of the legislation, which replaces the tax with four-year spending programs based on strategic needs. The new budget plan has its flaws, to be sure. For example, Chilean defense analyst Eduardo Santos says the four-year framework lacks flexibility. But another driving force is the difficult situation at Codelco, the world's largest copper producer and the source of that lucrative source of funds. The government-owned mining company desperately needs to upgrade its aging mines, while facing slumping copper prices. In short, it needs to keep more of the money it makes. The government last month let Codelco keep an additional $1 billion of profit, for a total of $3.2 billion. The finance ministry called it a necessary investment to keep Codelco's leadership in mining and to maintain its investment-grade credit rating. Long-term, the company needs to spend $24 billion to modernize its operations. It needs to expand production by 10%, or risk losing half its output. Codelco is mandated to give 10% of all its foreign sales to the military. That would amount to more than $1 billion in the first nine months of 2013, based on Codelco figures, although the government deducts much of that sum, and several billion in unspent funds are stashed away in an emergency contingency fund. As the principal government-owned enterprise, Codelco is Chile's cash cow. Its 2012 profit of $7.5 billion was a sizable chunk of a total budget of roughly $60 billion. If the copper tax is someday eliminated, it would be replaced with regular government funds, although certain spending floors would be guaranteed. The governments of Chile and Peru are striking a conciliatory tone as they prepare for the International Court of Justice's decision on their border dispute. Chilean President Sebastián Piñera and Peruvian leader Ollanta Humala agreed to issue a joint statement after the ruling is issued Jan. 27. Both are calling for calm and for the winning country to avoid boastful celebrations. Both presidents have made it clear they'll abide by the ruling, which affects a sizable chunk of the Pacific Ocean. Humala has said the two countries will "set an example" in their acceptance of the verdict, and that the ruling will set in motion a new agenda of cooperation with Chile. On the military front, all seems quiet. Rumors continue of reinforcements along the border, but nothing that can be substantiated. Update: Chileans in the city of Arica were alarmed when a Peruvian military helicopter flew over the border. But Chile said the Mi-17 did not violate Chilean airspace. Still, the flyover caused some anxiety.